Paramount Records was formed in 1917 with little fanfare and few prospects. Its founders ran a Wisconsin furniture company, knew nothing of the music business, and wanted only to produce records as cheaply as they could with whatever talent was readily available to them. By 1922, and on the verge of bankruptcy, its white owners embarked on a radical new business plan: selling the music of black artists to black audiences. This move, paired with equal parts dumb luck, opportunism, chicanery and a willingness to try anything, paid dramatic dividends. By 1927, Paramount was the most important label in the so-called Race Records field, selling hundreds of thousands of records. And by the time it ceased operations in 1932, it had amassed a dizzying roster of performers still unrivaled to this day, spanning early jazz titans (Louis Armstrong, King Oliver, Jelly Roll Morton), vaudeville songsters (Papa Charlie Jackson), the first solo guitar bluesmen (Blind Lemon Jefferson, Blind Blake), theater blues divas (Ma Rainey, Alberta Hunter, Ethel Waters), gospel (Norfolk Jubilee Quartette), masters of Mississippi blues (Charley Patton, Son House, Skip James) and the indefinable other (Geeshie Wiley, Elvie Thomas). 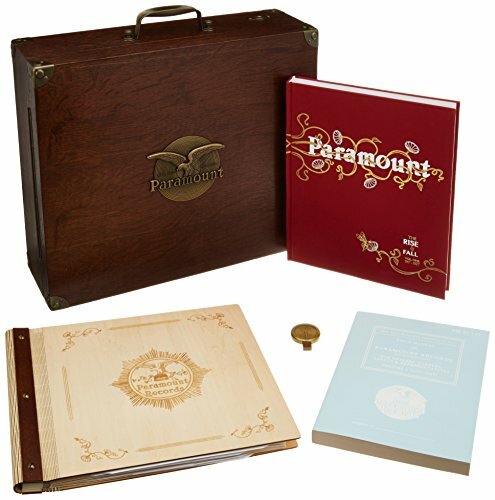 The Rise & Fall of Paramount, Volume One takes the form of a curated exhibit of words, images and music with Paramount at its fulcrum, all housed in a lush handcrafted cabinet that harkens back to the wunderkammern, precursors to the modern museum. Crafted as an object to keep and cherish for a lifetime, its form is designed to reveal evidence of the hand at work, to bring out the tactile richness of hand-sculpted woods and metals, and to meld the rough-hewn with the earliest burblings of American modernism in the 1920s. Its multi-format narrative tells the curious tale of the only pre-War record label to capture what America truly sounded like in the 1920s, in all its multitudes.